It can be difficult to feel like your best self with acne scars and other unwanted visible blemishes, and while many women and choose to hide these marks with clothing or makeup, others seek a more permanent acne scar treatment. An FDA-approved system utilizing fractional laser technology, laser scar reduction effectively minimizes acne scars, post-surgical scars, and stretch marks without damaging skin near the treatment area and without the inconvenience and downtime of an invasive surgical procedure. Depending on the type of scar present, there is a variety of FDA-approved systems such as fractional CO2, erbium, radiofrequency or the Picosure Laser with the Focus lens that can target the lesion in question. 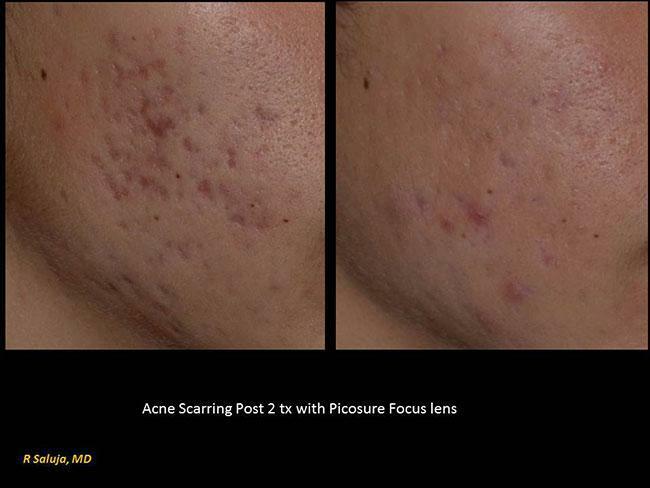 An acne scar treatment utilizing laser scar reduction begins with a consultation with a licensed and experienced medical professional. Fortunately, this laser technology can be applied to all skin types and is not limited to specific regions of the body. More importantly, treatment sessions are brief, and while many patients require a few treatments to achieve optimal results, the procedure to eliminate surgical and other scars is non-invasive with minimal downtime, allowing patients to resume their normal activities, including appreciating their newer, healthier skin.